Not Sure What Parts are Needed For Installation? Click Here! Our high quality window screen materials are manufactured to the size and specifications you need. Simply select your frame size, frame color, hardware and mesh type from the menu above. Window screens replacements are made within 1/16" of the dimensions you provide. 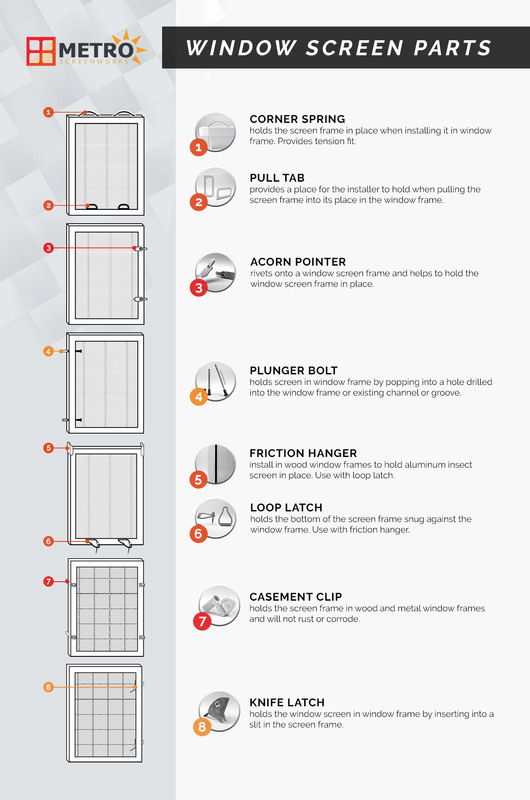 Our window screen replacements are shipped to you fully assembled, ready to install. Please allow an estimated 5 to 7 days for production. Our quality window screen materials are durable and strong. Replace your window screens with high quality window screen materials. Buy replacement window screens in bulk and save. Order window screen replacements to let fresh air in and keep insects out. 1800-413-2579 https://www.metroscreenworks.com/shop/index.php?main_page=index&cPath=20 Custom made window screens is our specialty. Replacement screens can be ordered easily online or by phone at 1-800-413-2579. We offer all types of screen mesh including standard fiberglass screen, invisible UltraVue screen and durable super screen. Also the exact screen frame you need and screen frame hardware of your choice. 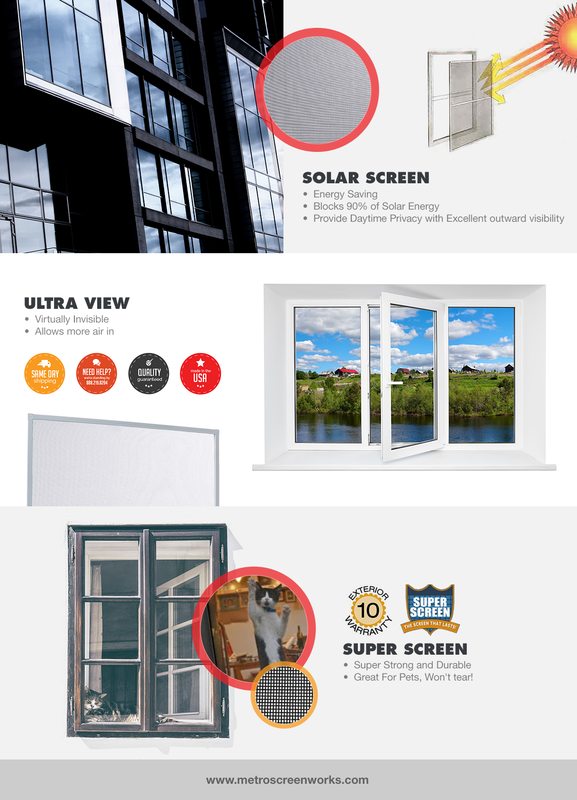 If you do not see what you are looking for please call us as we carry all types of window screens. All of our replacement window screens are made to your specifications to fit your windows. 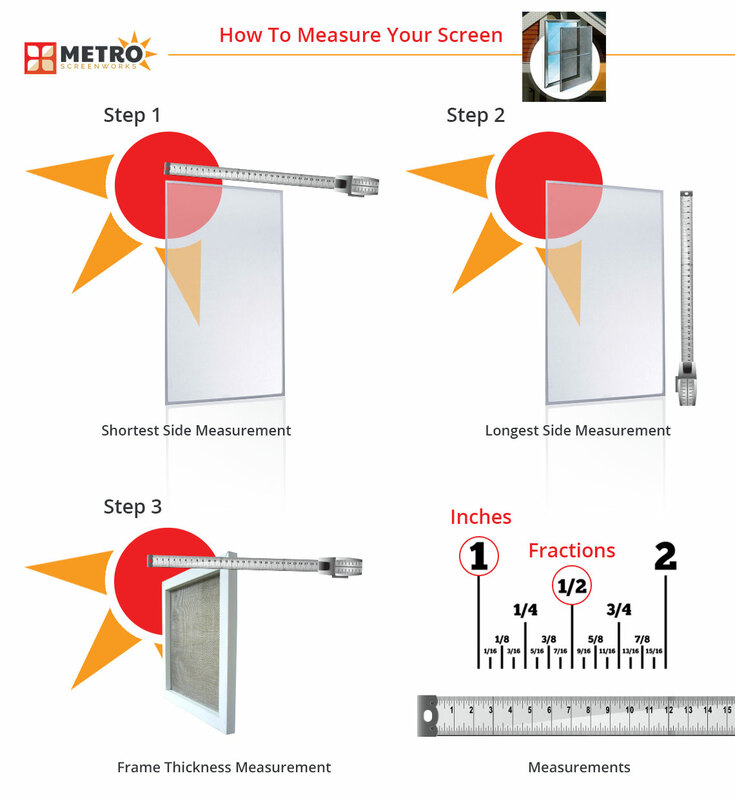 Watch our instruction video, to see how to measure your window screens, and then follow our easy online ordering menu. We ordered 8 screens, two sizes, both a perfect fit! Please don't be put off with the shipping coast as they are extremely well packed and arrive in excellent shape. None were bent nor had a single scratch! And fast too! Will recommend Metro Screenworks to everyone. I ordered 3 screens on-line and they arrived within 2 weeks. They fit the windows perfectly and are of good quality. I will definitely use Metro Screenworks again. Product arrived on time, undamaged and fits perfectly. I'm so happy with the 2 replacement screens I received, I plan to order more. Exceeded my expectations in quality, ease of purchase, customer service and delivery, and price. I could not be happier with my new sunroom screens. Thank you, Metro! Screens ordered fit perfectly. Very satisfied with order. Thank you for great service.? They are as ordered except -- the push pins were not put in the correct location as specified in notes. I believe the screens will still stay put do to the sung fit. The Screens came exactly as ordered. They were securely packaged. The screens are top quality. They fit into my windows perfectly.